Pick up your Mishloa h Manot Basket. We have one for every TIC family! 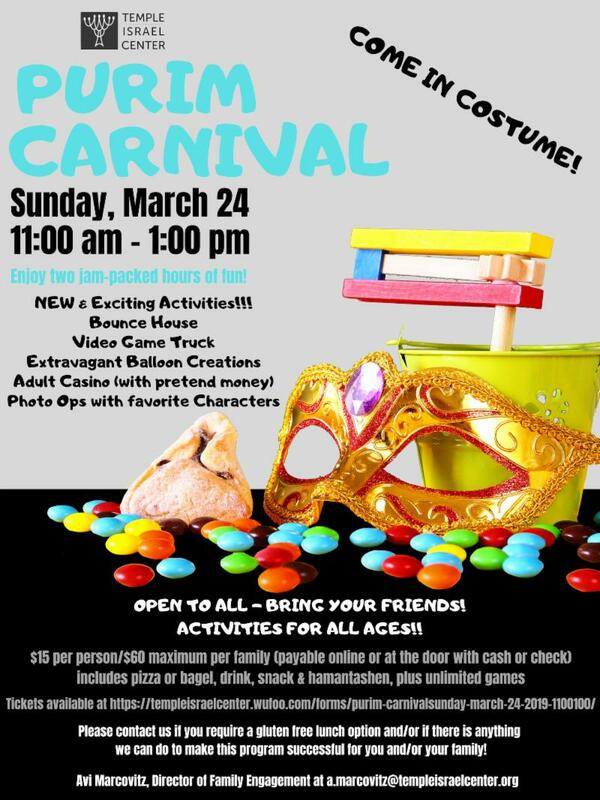 There are lots of new and exciting activities at this year's Purim Carnival. Cost is $15 per person/$60 max per family - includes a meal and unlimited games. Ticket registration closes on Saturday night at midnight. Buy your tickets here . Click here for details. Questions? Email us here . 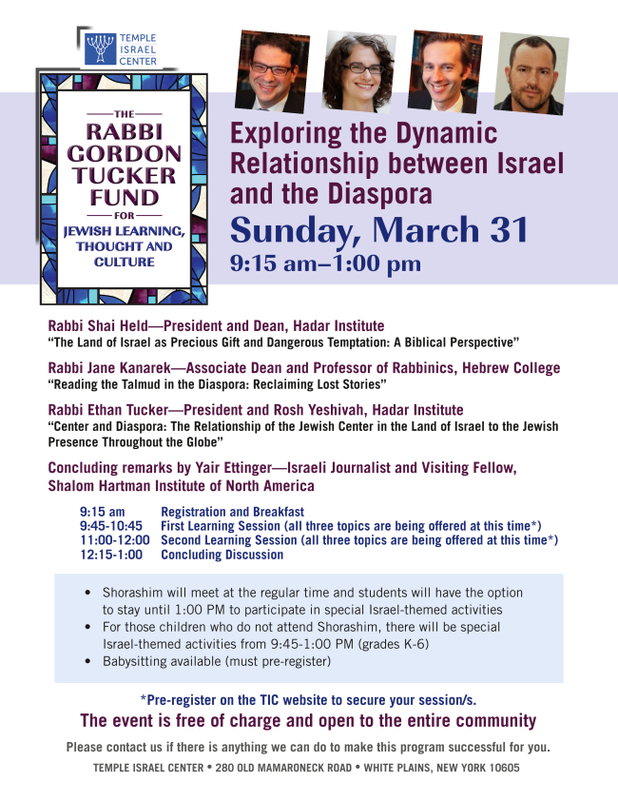 "Exploring the Dynamic Relationship Between Israel and the Diaspora"
Join us for an exceptional morning of learning as we welcome four distinguished Jewish scholars: Rabbis Shai Held and Ethan Tucker, Hadar Institute; Rabbi Jane Kanarek, Hebrew College; and Journalist and Hartman Fellow Yair Ettinger. The event is free and open to the community. Israel-themed children's activities and babysitting available. From 9:15 am-1:00 pm. Please register here. 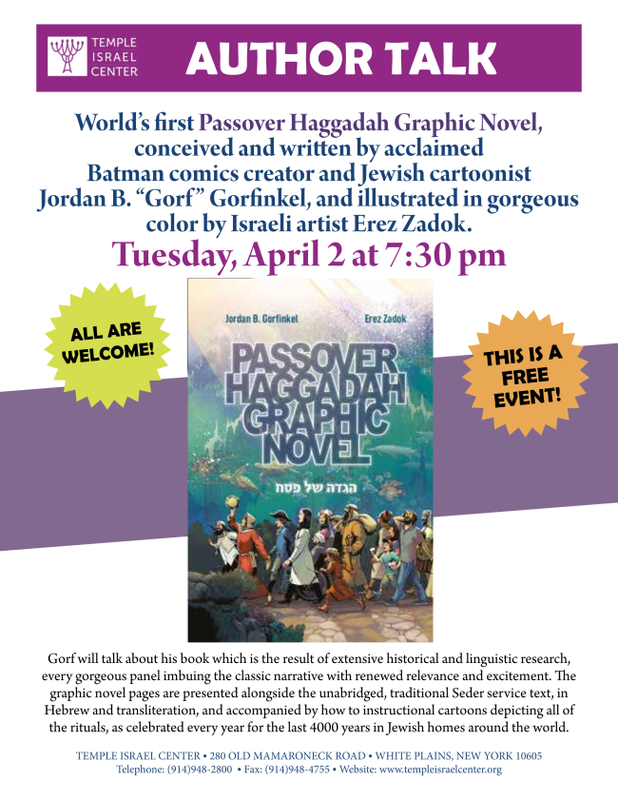 Join us as we welcome the world's first Passover Haggadah Graphic Novel Creator and Cartoonist Jordan "Gorf" B. Gorfinkel, He will be talking about his book at 7:30 pm at TIC. This is a free event. Click flyer for details. 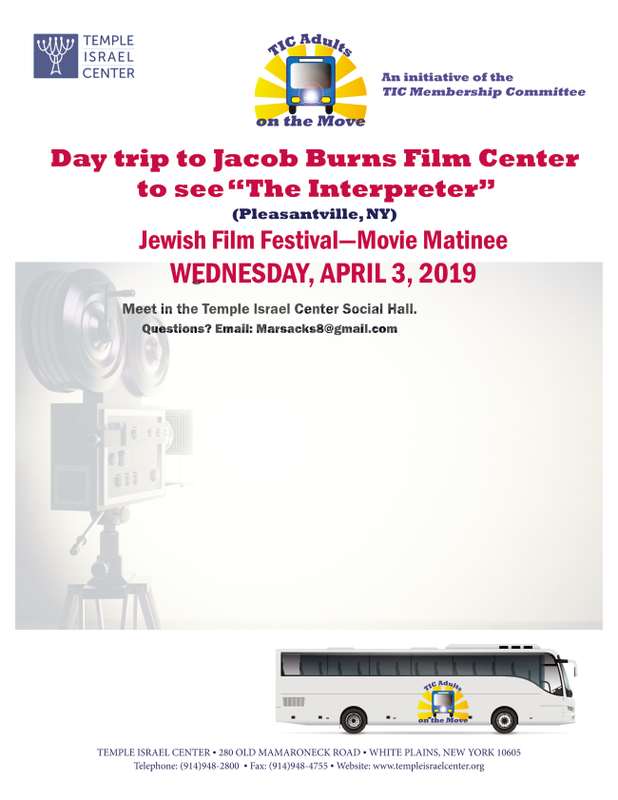 We're seeing the movie The Interpreter , part of the Movie Matinee Jewish Film Festival. The day includes brunch, movie talk, a coach bus ride and feature film. Registration is now closed. If interested, call the TIC office to check for cancellations. 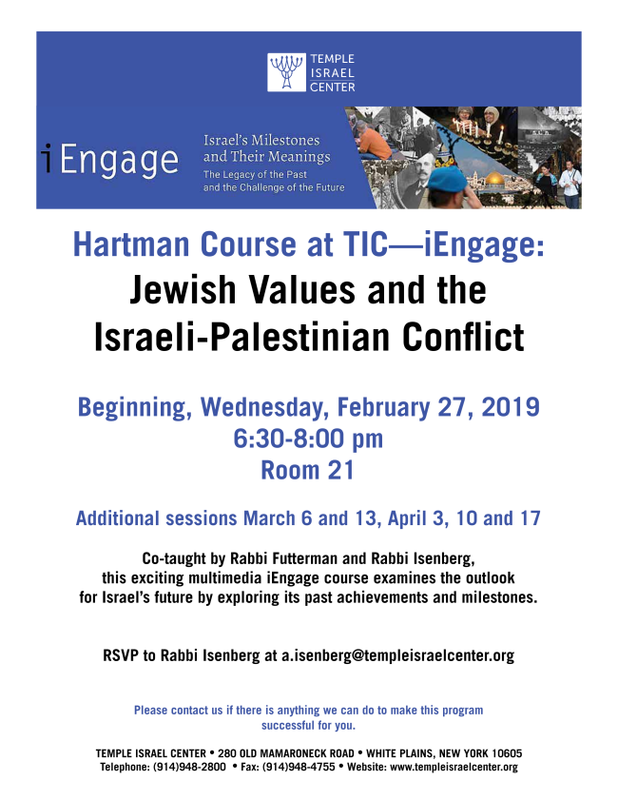 This series of exciting multimedia courses examines the outlook for Israel’s future by exploring its past achievements and milestones. 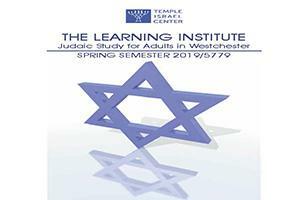 Click here for details and additional course dates. From 6:30 - 8:00 pm. RSVP here . 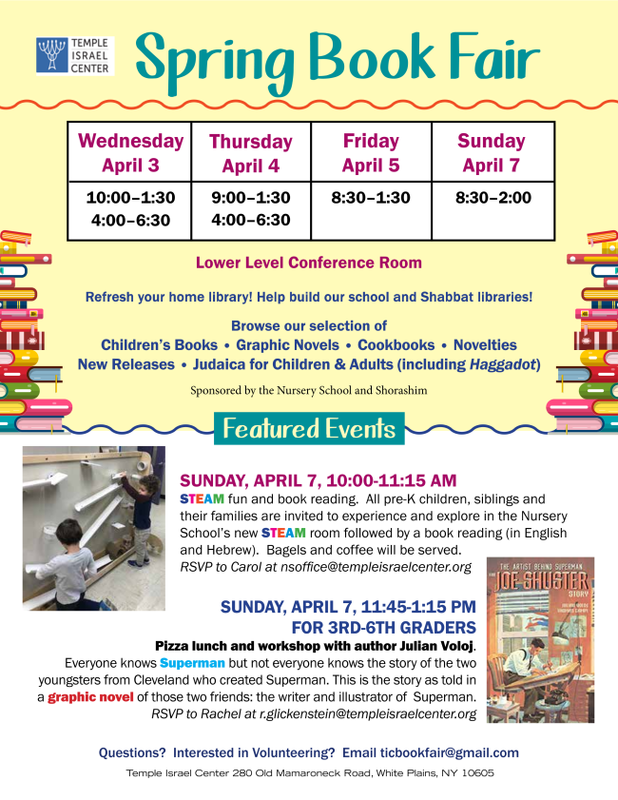 Refresh your home library and help build our school and Shabbat libraries! Come to the TIC Spring Book Fair and browse our wide selection of children's books, graphic novels, cookbooks and much more. Click flyer for details. 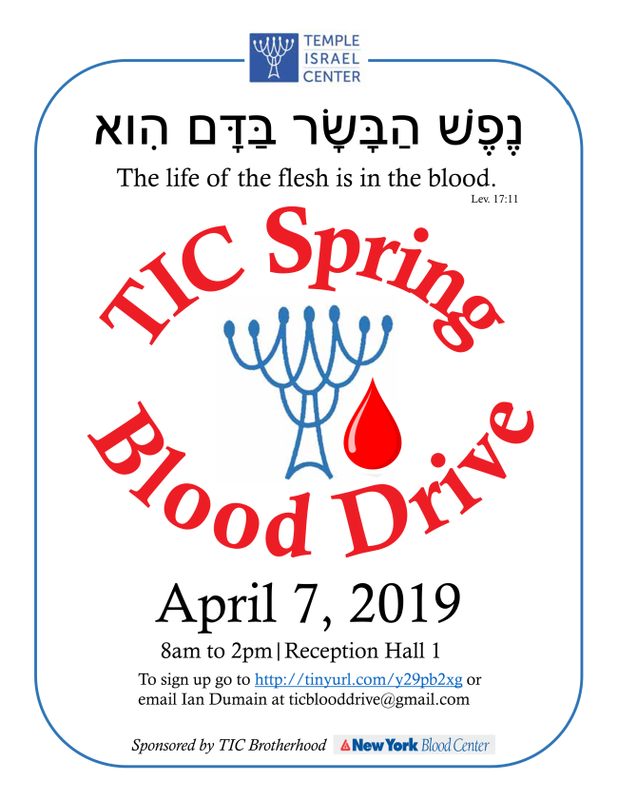 Consider doing a mitzvah and help our community maintain an adequate blood supply! Free cookies, juice and the satisfaction of helping others. Sign up for the Spring Blood Drive here! Questions? Email us here . Click flyer for details. 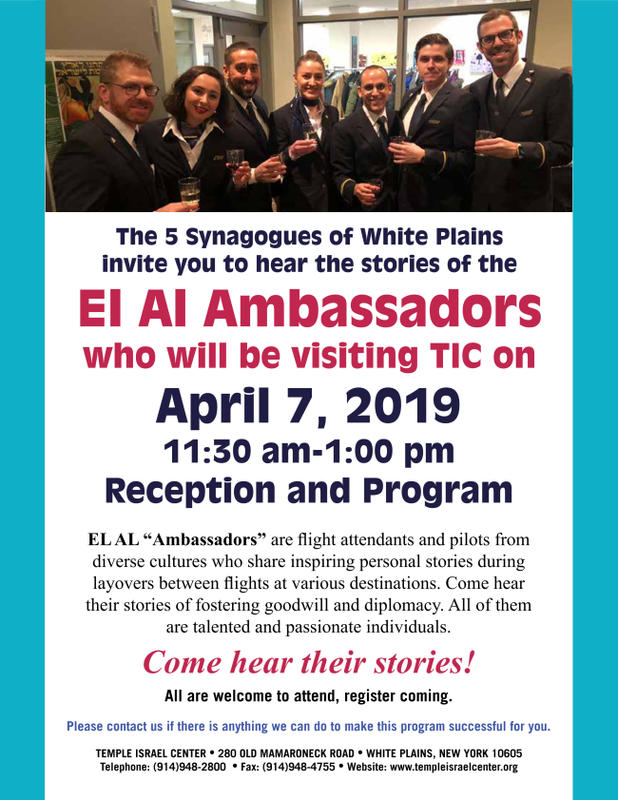 Flight attendants and pilots from El Al get personal as they share inspiring stories from their travels across the globe. Reception & program. Click flyer for details. Hosted by the 5 Synagogues of White Plains. A pre- Pesa h learning session with Dr. Joshua Kulp, Rosh Yeshiva and Co-Founder of the Conservative Yeshiva at the Fuchsberg Jerusalem Center. Taking place at a TIC members' home at 7:30 pm. 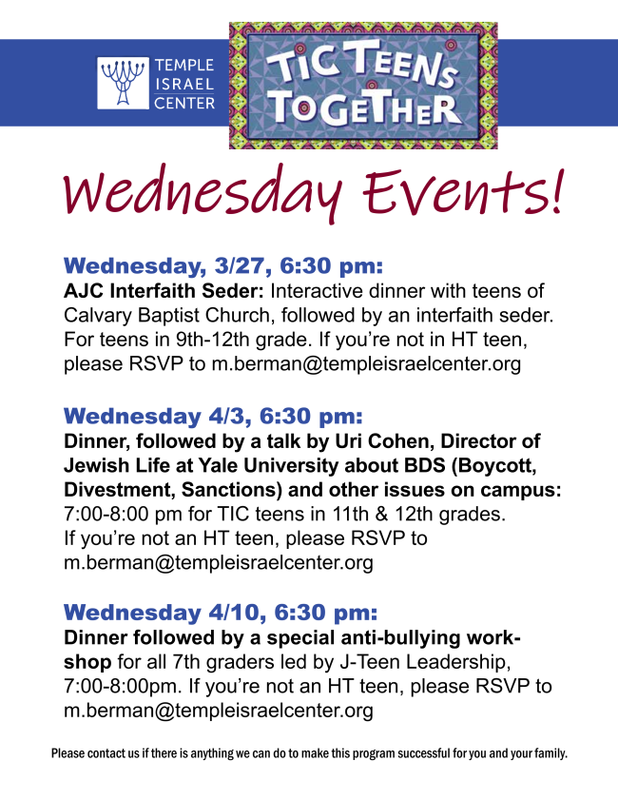 AJC interfaith Seder: Interactive dinner with teens of Calvary Baptist Church, followed by an interfaith seder. For teens in 9-12 grade. If you're not a HT teen, please RSVP here . 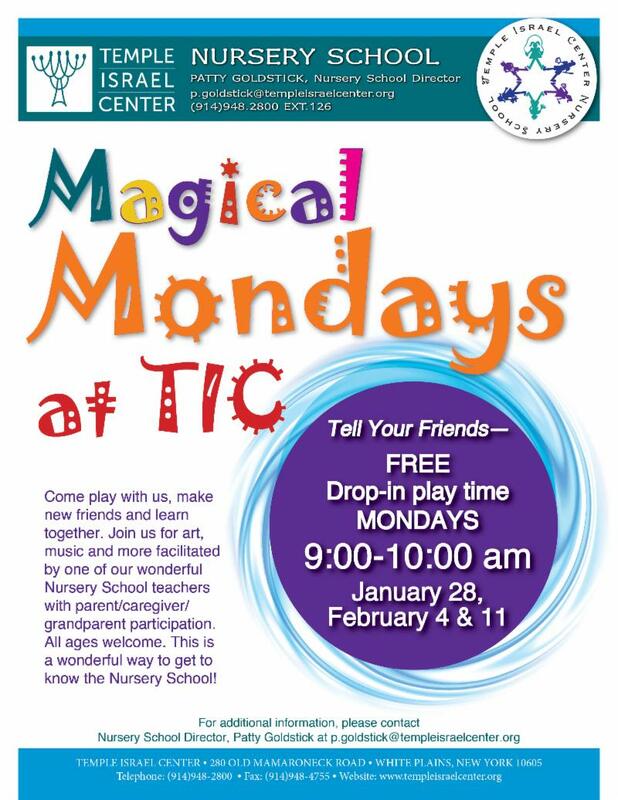 Click flyer for details and additional TIC Together events. 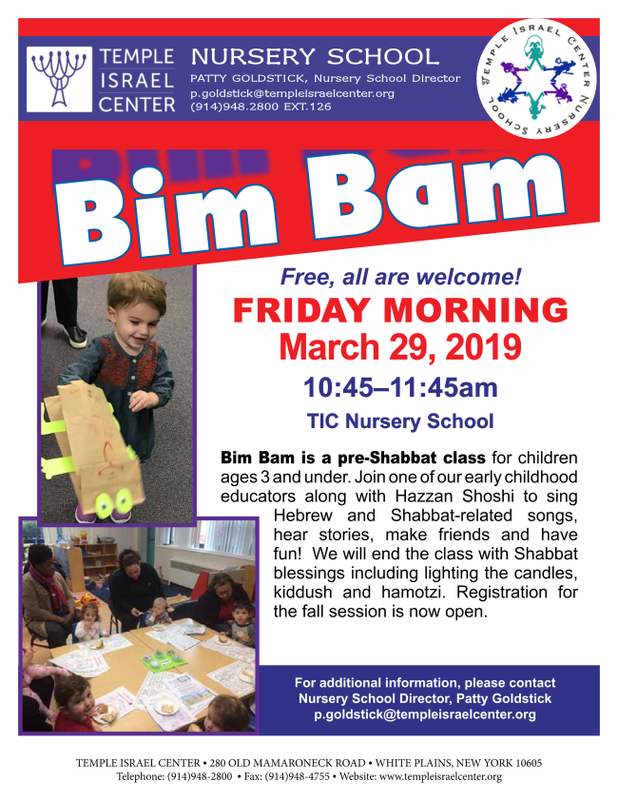 The March 21st class led by Rabbinic Intern Mitch Blank is canceled. 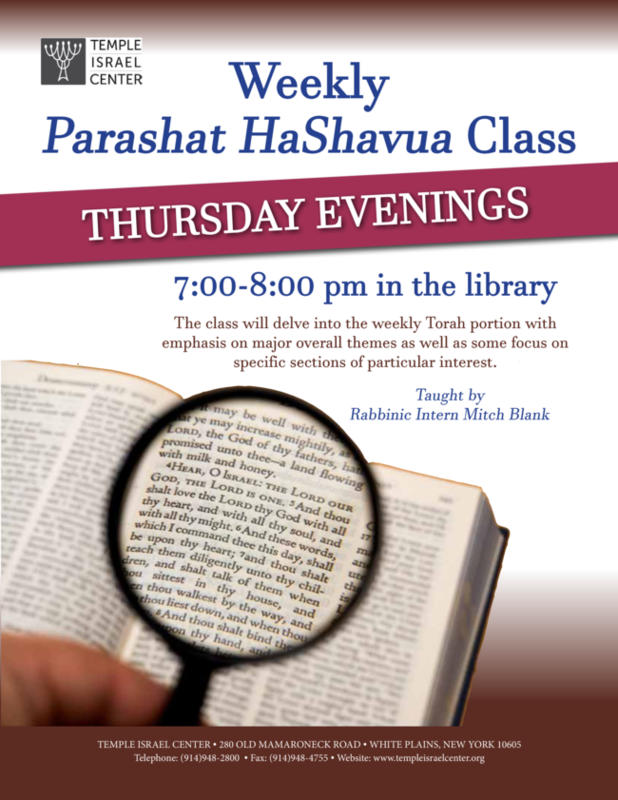 The next class will take place on Thursday, March 28. 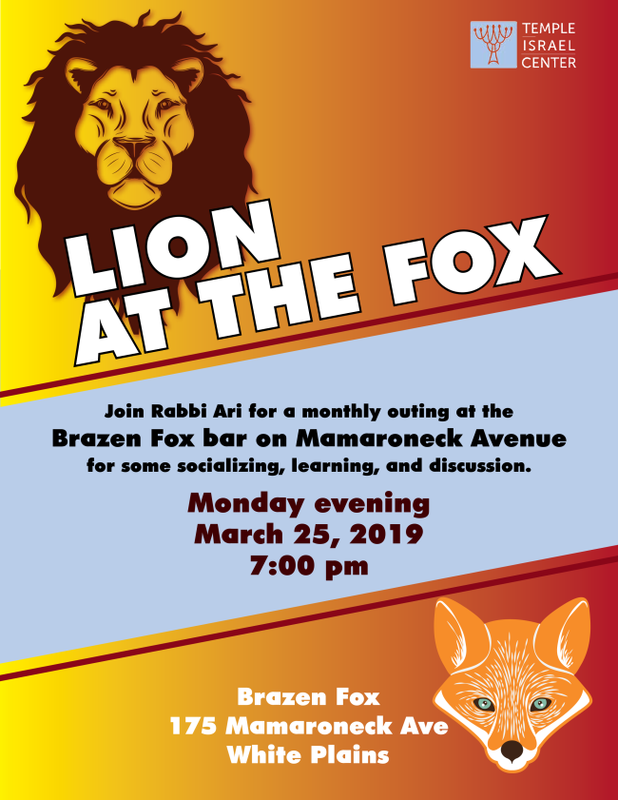 Join Rabbi Ari at the Brazen Fox Bar for some socializing, learning and discussion. Click flyer for details. Join us for one or both sessions! Session one explores the writing of Philip Roth as it relates to the Jewish experience. 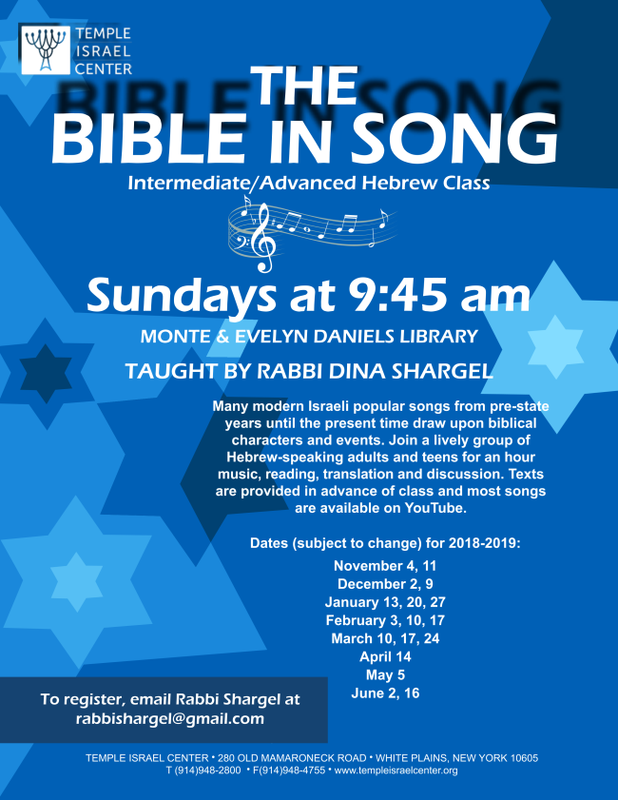 Session two highlights the Books of Esther and Ruth - just in time for Purim and Shavuot! Click here for details. The March 29th Breakfast & Learn has been canceled. The next class will take place on Friday, April 12. A skilled teacher will help you make a clay artifact that expresses your story. Participants will work in pairs and have an opportunity to share stories and create a clay project. Taking place at Arts Westchester, 31 Mamaroneck Ave in White Plains. Additional dates: 4/3 and 4/11. Register here or call 914-573-8906. 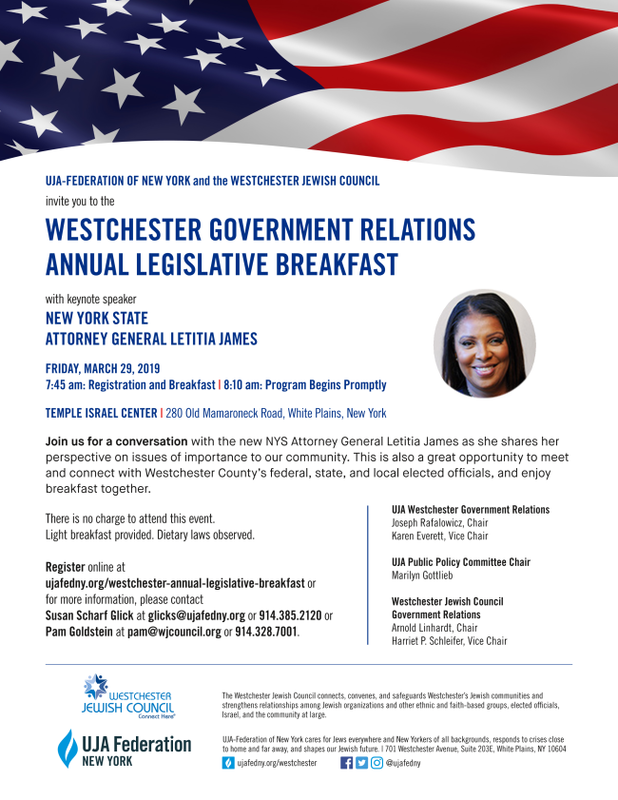 New York State Attorney General Letitia James will keynote at this annual breakfast taking place at Temple Israel Center. 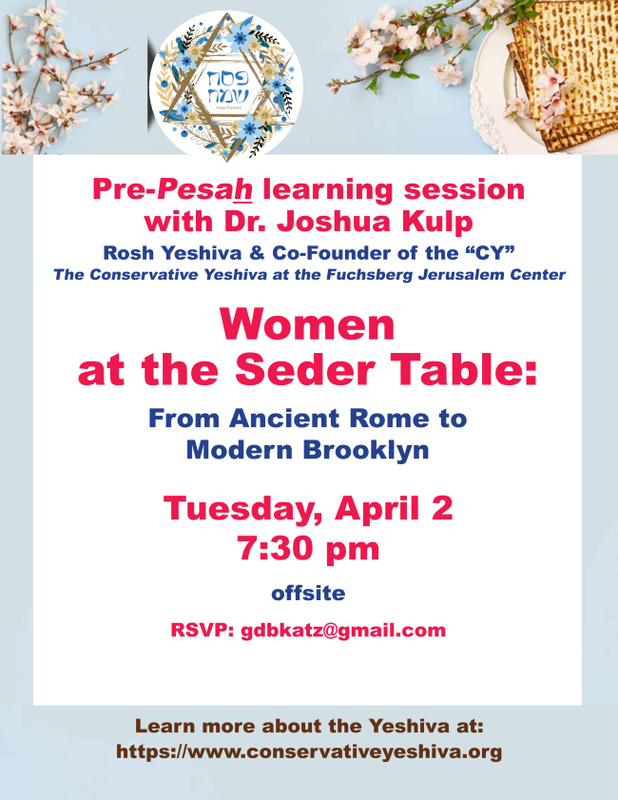 The event is free and co-sponsored by UJA-Federation and Westchester Jewish Council. Click flyer for details & register here. 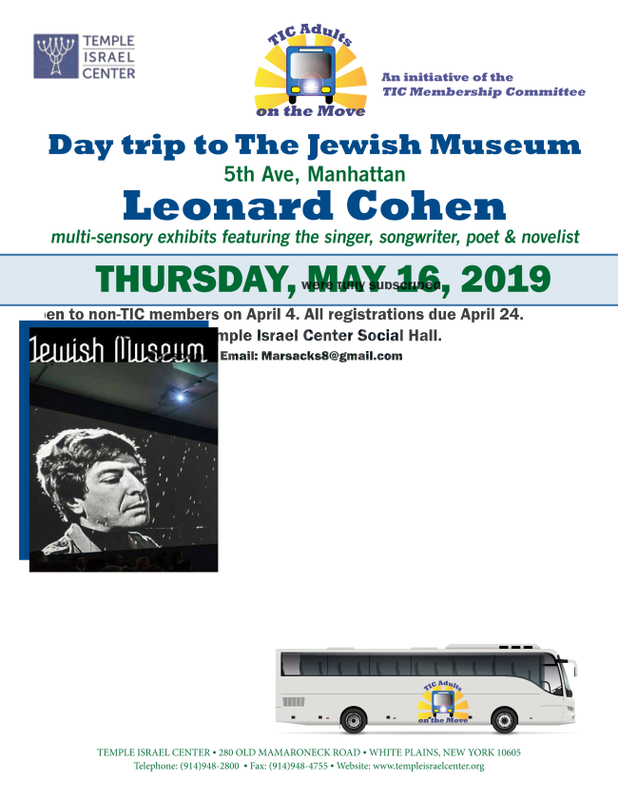 Brotherhood of Temple Israel Center invites you attend the awards dinner honoring our own Rabbi Ari Isenberg, 2019 Man of the Year, and TIC member Deborah Margolis, 2019 Youth of the Year. Mazal tov to the honorees! Click here for information. 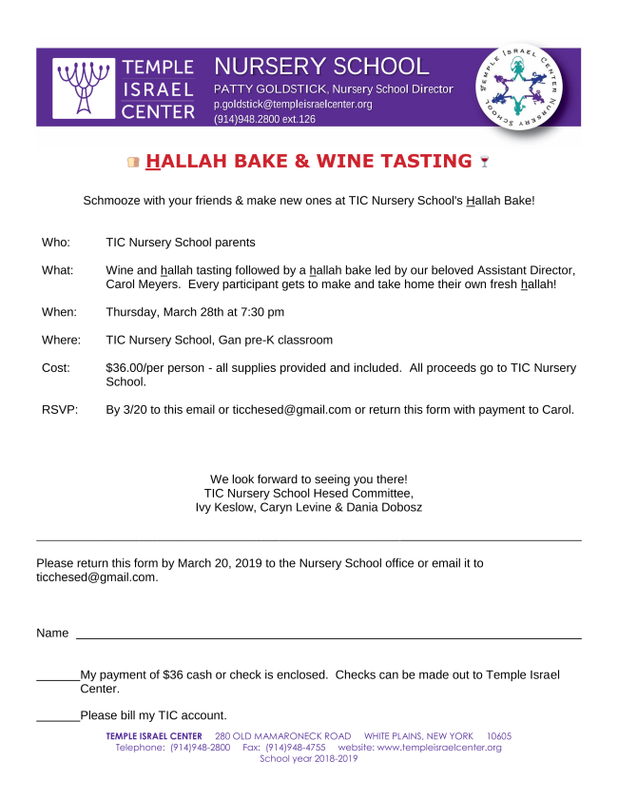 Join us for wine and h allah tasting, schmooze with your friends and make new ones at TIC Nursery School's Hallah Bake, led by Carol Meyers. Every participant gets to make and take home their own fresh h allah. Click flyer for details. We are excited to be planning for our Fourth Annual Book Fair! We will have a special STEAM activity and book reading for all pre-K children, siblings and their families. Bagels and coffee will be served. Click flyer for details. 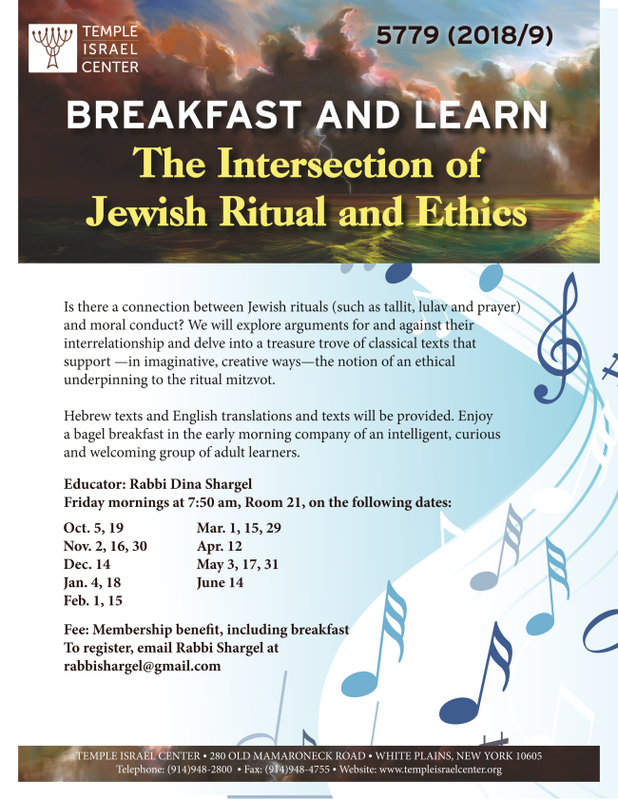 Join H azzan Shoshi Levin Goldberg and learn how to make meaningful rituals at home with your family. Connect with other parents of young babies while enjoying coffee and bagels. This is a free event. Click flyer for details. 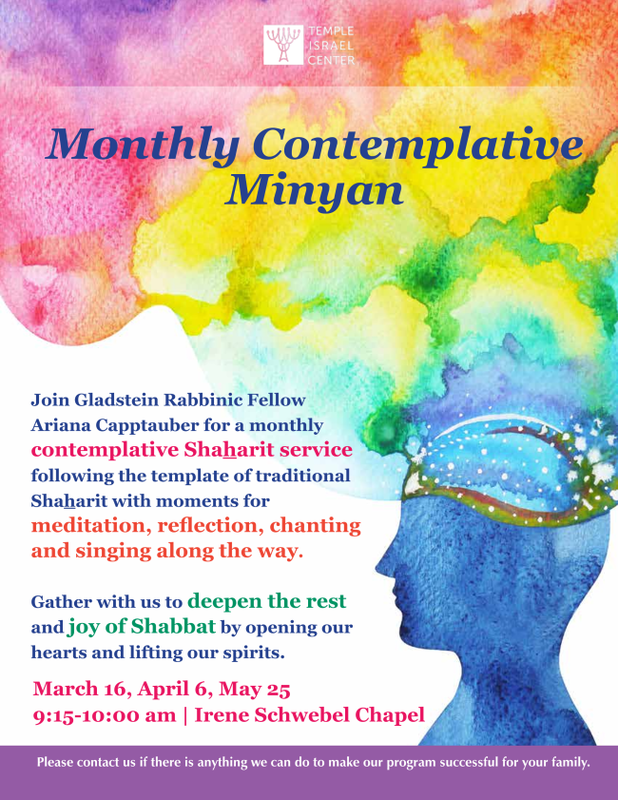 Please check out our special events on March 27, April 3 and April 10 . ﻿ Click flyer for details.